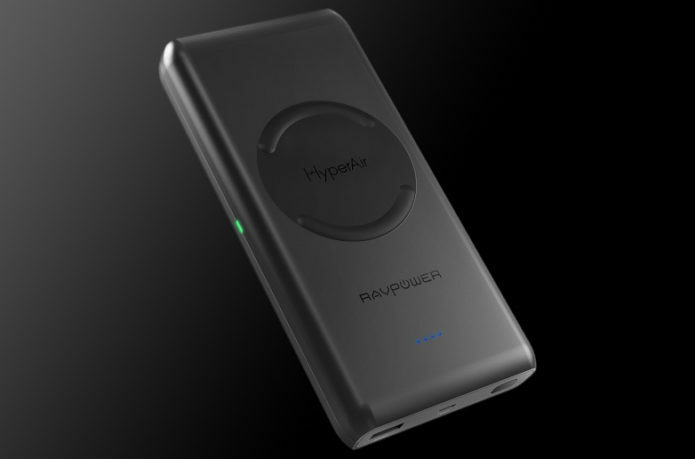 A slightly bigger, more powerful portable battery with wireless charging built in. 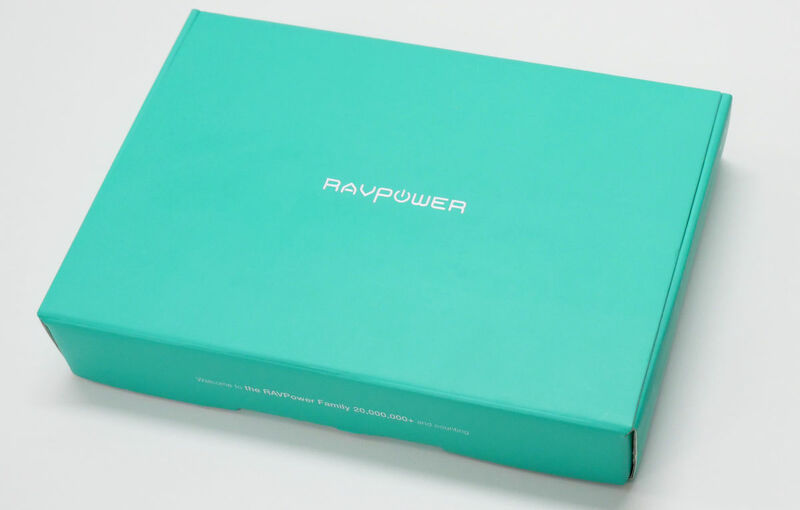 The RAVPower 10,400mAh Wireless Portable Charger is designed well, isn’t terribly expensive, and does exactly what it’s supposed to do: quickly charge your devices on the go, with or without a cable. Charge a phone using the wireless pad while you also charge another device via the pack’s USB port. 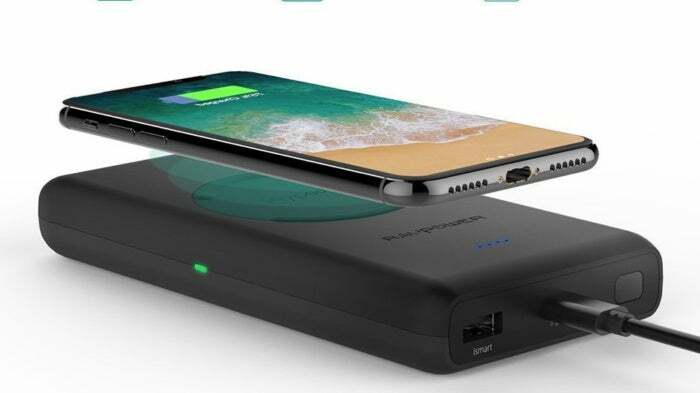 The overall design of this rendition of the Portable Wireless Charger is rather mundane. A black plastic exterior is broken up on top by a small, rubberized circle where the wireless charging pad is located. 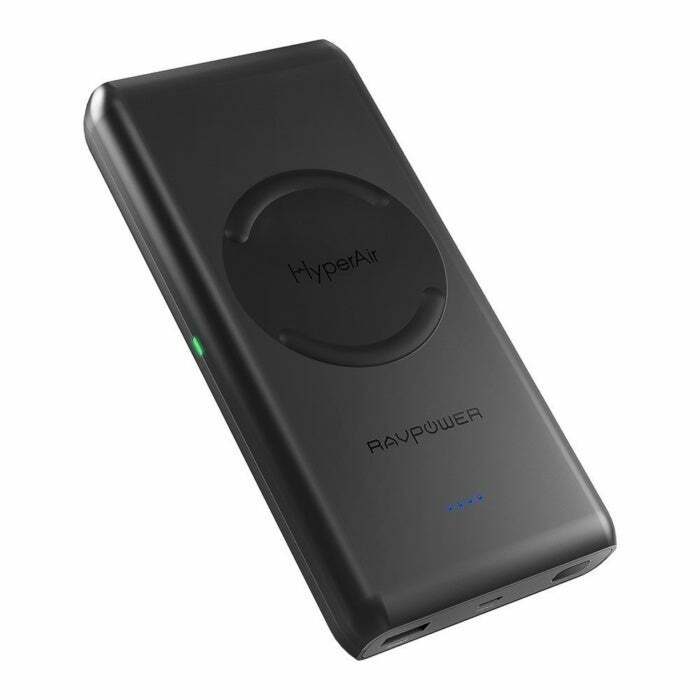 On one end of the pack is a power button that looks more like an IR transmitter/receiver that you’d expect to find on a TV remote, a Micro-USB port to charge the pack, and a USB Type-A port. Four indicator lights are found on the top of the pack, indicating the pack’s current charge level in 25 percent increments. 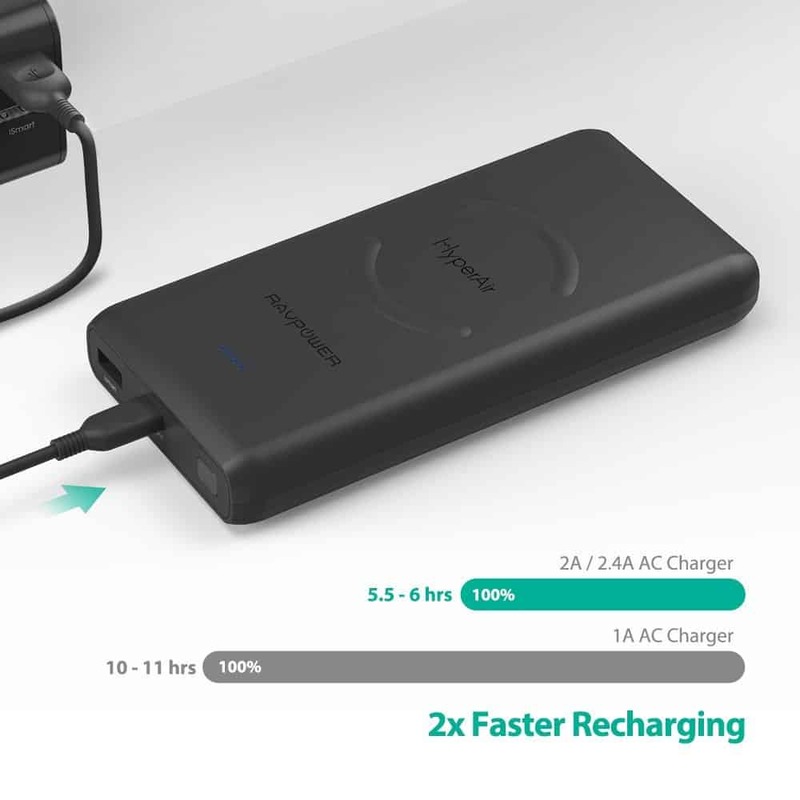 On the left side of the pack is another indicator light that turns green when the wireless charging pad is in use, letting you know everything is lined up properly. The USB port is capable of charging a smartphone or tablet at a maximum of 5V/2.4A. 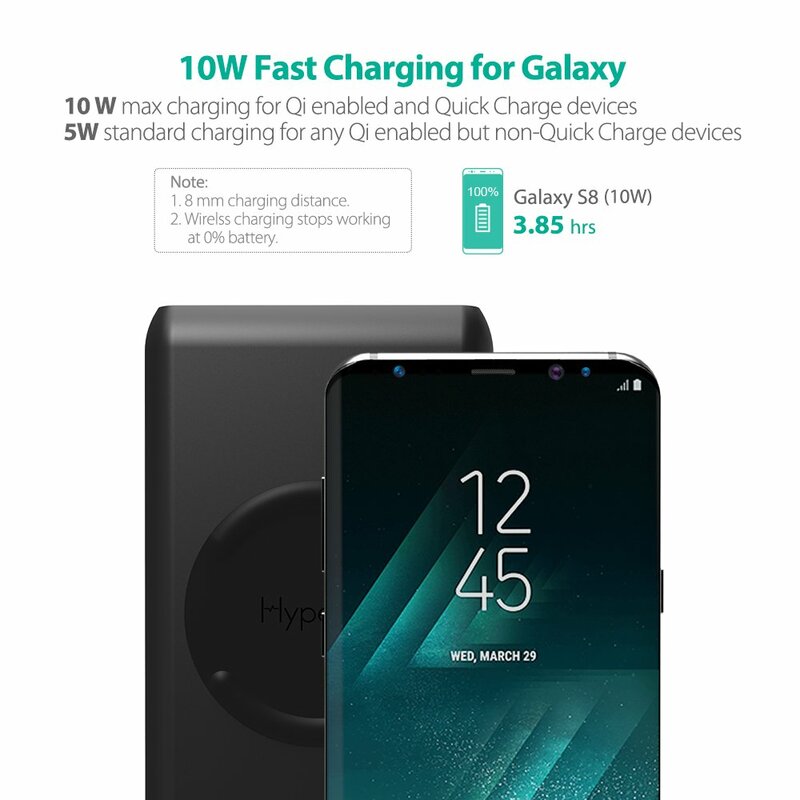 The wireless charging pad offers 10W charging for Samsung devices and 5W charging for all other Qi-equipped devices. 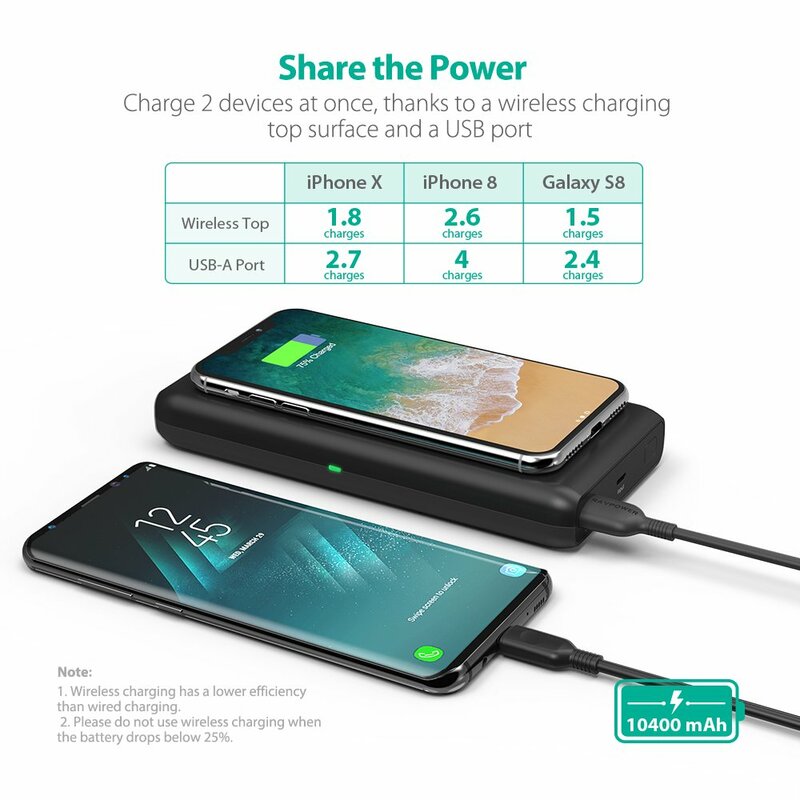 The RAVPower product listing is a bit confusing, as it states this pack will charge an iPhone at 7.5W speed in one graphic, however, another graphic doesn’t mention the iPhone and 7.5W charging speeds at all. For the record, our testing results are more in line with we’d expect from a charger using 5W. Over the course of an hour, the pack wirelessly charged an iPhone X from empty to 30 percent. When placing a Note 9 on the charging pad, it did indeed indicate it was fast charging via wireless means. Included the box is a carrying case and a microUSB cable to charge the pack.